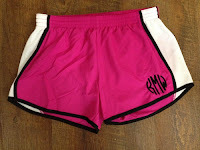 We are so excited about today’s post because we love the Pink Azalea boutique (located in Greenville), and we are so very in love with these new monogrammed gifts and chevron beauties they wanted us to share with you today! Ladies, we only have about a month left to get ready for the first tailgating of the season – whether it’s in the Georgia Dome parking lot, at your local Sports Bar or in your own backyard. The Pink Azalea has everything you need to be prepared. First things first – the outfit. Even if you’re cheering on the Tigers in front of a TV, you can still get dressed up in Clemson style. Chevron is very popular right now (did you see our skirts at the Ladies Clinic?) and for a good reason since it’s a fun pattern and flattering on everyone. How gameday perfect is this cute purple chevron dress with orange trim? 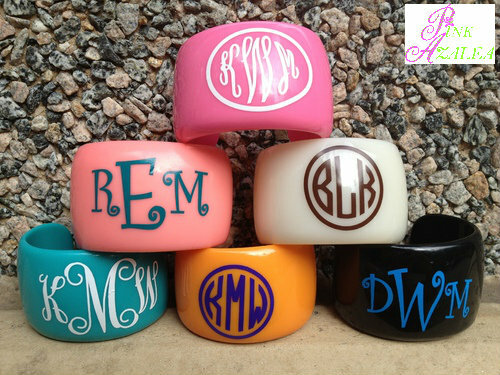 And what’s even more fabulous is you can get them monogrammed! And to make sure you look your very best in this dress, you’ll probably get in a few runs the week before the game. You don’t have to sacrifice style when exercising – how cute are these monogrammed running shorts? They are available in six different color combos! Of course you need to accessorize the dress – how about this adorable monogrammed bangle from the Pink Azalea? 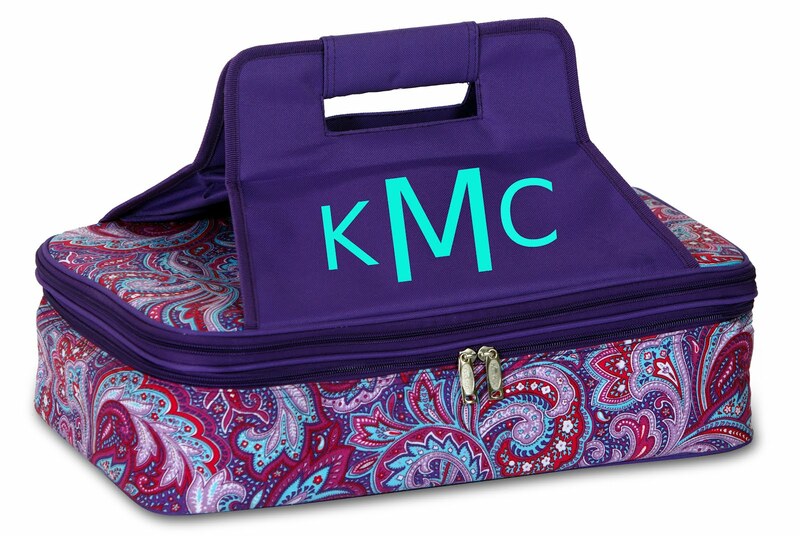 It’s available in a variety of colors, but we’re partial to the orange with the purple monogram. Don’t show up to the tailgate empty handed, pack your favorite tailgate recipe in this super cute casserole carrier – complete with your monogram. It’s available in six different colors, holds 2 pyrex dishes, and is insulated for both hot and cold foods. And a tailgate isn’t complete without cold beverages, right? So don’t forget to bring your new chevron insulated cooler tote from the Pink Azalea – available in orange and purple and orange and white. 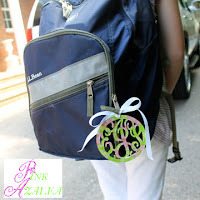 You will also need one of these adorable Lilly Pulitzer monogram luggage tags. We’re pretty sure you won’t be the only Clemson Girl carrying the cute chevron cooler tote – so you’ll need to secure this luggage tag with your monogram to your tote to make sure no one takes your cooler home by mistake (or takes beverages out of it). And for everything else you need to carry to your tailgate event, you will need one of these large totes – available in a great orange and purple pattern or an orange and white pattern. These totes are strong, can fit anything, and look great with an added monogram on them. Finally, if you’re making the trek to Atlanta for the first game, it’s probably a good idea to keep track of your car keys. 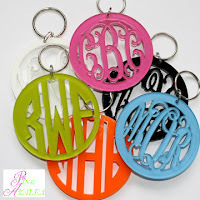  This adorable monogrammed keychain will help you do just that - available in two different fonts and 17 different colors. The Pink Azalea is your one stop shop to get ready for Clemson gameday! START SHOPPING! The Pink Azalea would like to give one very, very lucky Clemson Girl one of these super cute orange and purple chevron insulated cooler totes! ‘Like’ Pink Azalea on Facebook, then comment on this photo on their page with “Clemson Girls love the Pink Azalea” (1 entry). Tweet about this giveaway on Twitter, include a link to this post and copy @clemsongirl (1 entry). 5. Email a link to this giveaway to two friends and copy clemsongirlblog@gmail.com (1 entry). Deadline for entries is tonight, July 25th at 7:00PM EST. We will compile all of your entries, randomly draw a winner, and announce the winner on the blog soon after. The winner has 48 hours to contact us after we post their name or we will draw a new winner. Special thanks to the Pink Azalea for sponsoring such a fabulous giveaway!! Good luck ladies! Such cute stuff! Ready for Clemson football! Go Tigers! Shared this cute dress on Facebook! Need this in my closet for this year! I also shared on Facebook and Twitter. Ready for some Clemson football! The Pink Azalea dress is perfect! This Clemson girl would love to win! Can't wait for football season! Just posted the giveaway on my FB page. I have shared the giveaway on facebook! Laura P- Lexington, SC Can't wait for some Clemson Girl stuff for this season! So ready for cooler temps! I shared about giveaway on FB!! I seen these at ladies clinic and just loved it! Would love to win this!